For this month's Stamp-A-Stack, I had several people brave the cold and road conditions to come stamp all occasion cards. I had a Friday night and a Saturday morning group and both times there were some people joining us for the first time. I like to give them a little treat to thank them for coming to stamp with us. This month, I used a Scallop Circle made with the Big Shot. It was just a matter of scoring in the right places to fit my choice of miniature candy bar. Anyone who knows me won't be surprised that I picked Hershey bars, but you can adjust depending on the treat you like. Just fold up from the bottom, tuck the candy inside and fold both sides in. I used the new Pinking Hearts Boarder punch from the Occasions Mini Catalog for a belly band and covered that with a simple stamp from Love You Much. Very cute. I need to come to a stamp-a-stack. 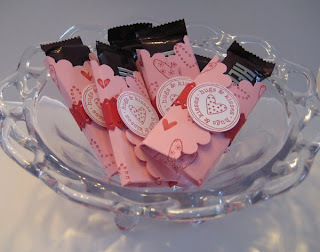 What a great idea for valentines for kids at school or to exchange with their friends! adult cards. Great new idea.